As much as I love a challenge in the kitchen sometimes I like to keep it simple. Very simple. 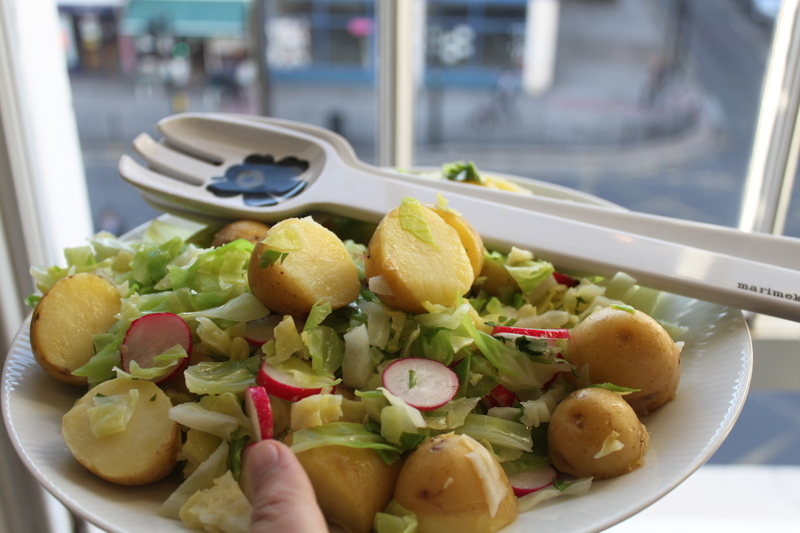 This classic Scandinavian potato salad is great with fish or barbecued meats (but substitute the dill with parsley and go easy on the lemon to combine with meat) and gives me hope that spring (and summer) is just around the corner. Boil the potatoes and drain. Leave to cool slightly (or have already cold cooked potatoes at the ready from the day before, although lukewarm works well). Dice the potatoes. 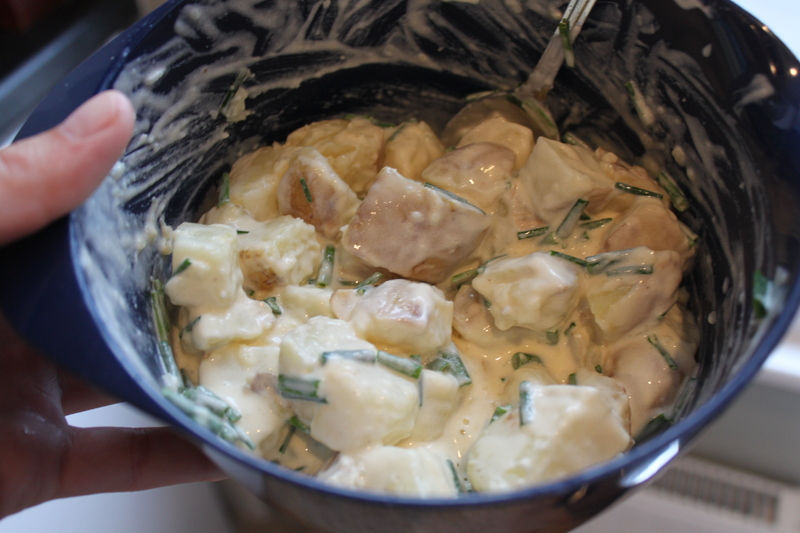 Mix creme fraiche, mayo, lemon juice and dill in a bowl and add the potato. Season to taste. 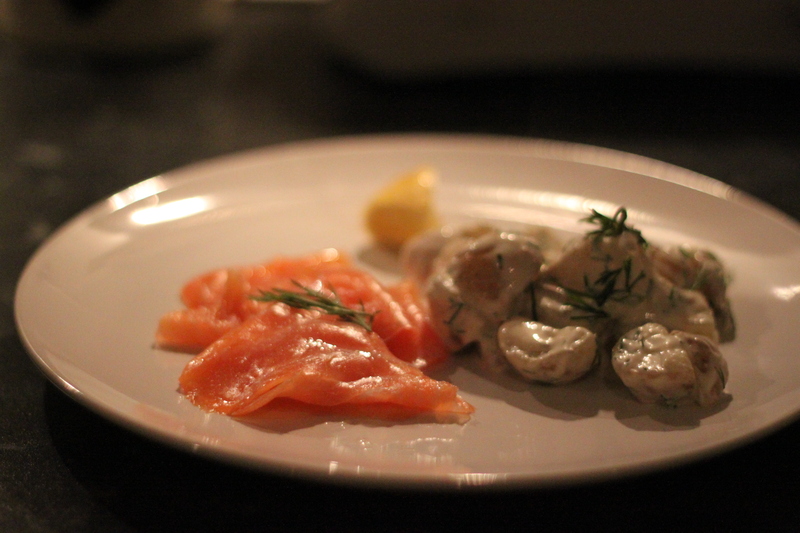 Serve with a few slices cold smoked salmon and a lemon wedge. On Wednesday I had some friends over for dinner and because of the gorgeous weather of late I decided to keep a summery and fuss-free approach to the food. We started with a pre-dinner drink from Germany, called Hugo, that my bestie Emma introduced to me. 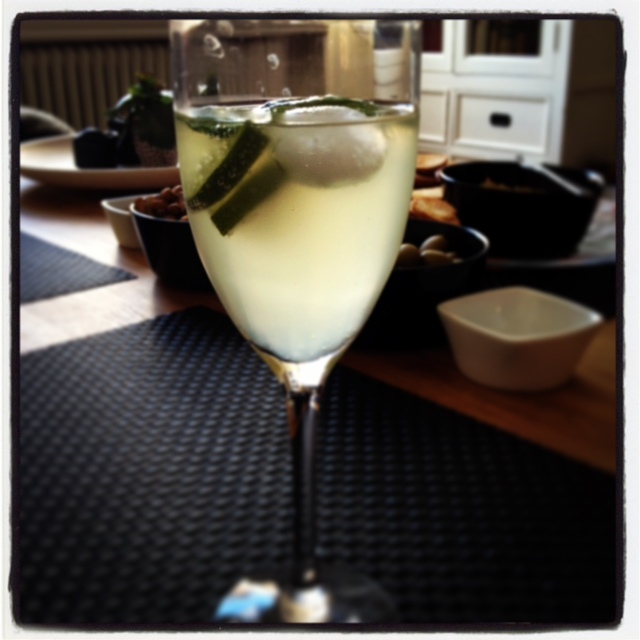 It is so refreshing with elderflower, bubbly and mint. I kept the starter simple and served it on a large plate. Scattered on a bed of rocket, these little Parma ham parcels are filled with sundried tomatoes and cream cheese and drizzled with a good olive oil and crema di balsamico. 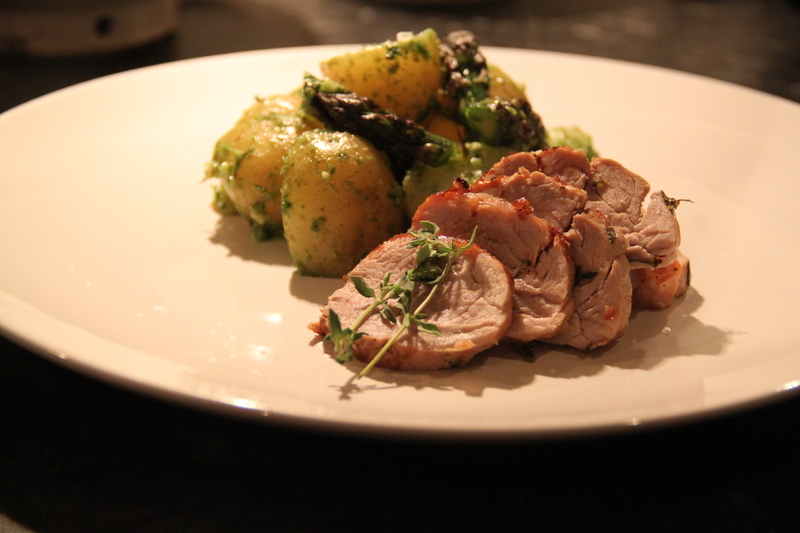 For the maincourse we had caramelised pork tenderloin slices with an amazing all-in-one potato salad with new potatoes, asparagus, cherry tomatoes and water cress and a lovely (yet incredibly simple) parmesan and lemon crème. As I was short of time prepping that evening, I had the pudding already sitting in the fridge as I made this stunning dulce de leche cheesecake the night before. We had such a fun evening with the wine flowing, lots of laughter and fun conversation. Thanks guys! Spread out the rocket on a large plate. Mix the chopped tomatoes with the cream cheese. Season to taste. Place a dollop of the mixture onto each ham slice and fold into a parcel. 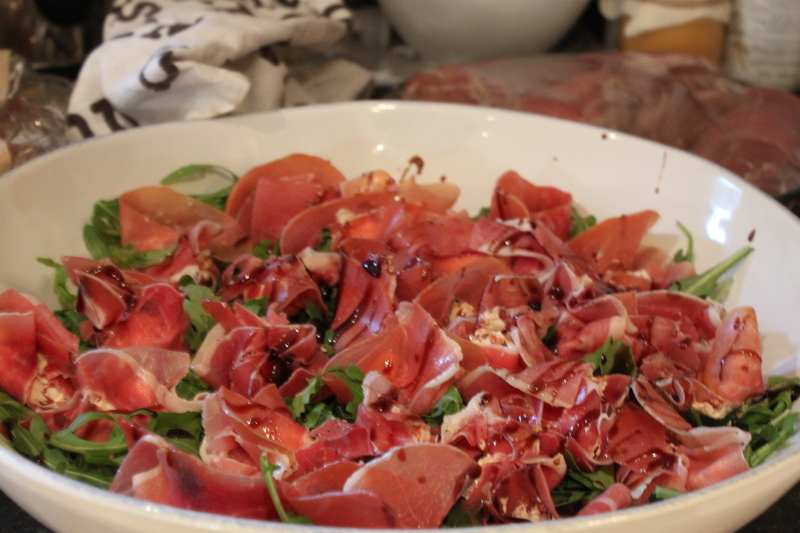 Place the parcels on the bed of rocket and drizzle with olive oil and crema di balsamico. Add basil leaves. Serve with bread and butter. Wash and cut the potatoes into large chunks. Cook, drain and leave to cool. Cut the asparagus into inch-long pieces, steam/boil for 2-3 minutes, drain and place in ice water. Drain. Cut the tomatoes in half and add to the potatoes and asparagus. Add the watercress. Mix mustard and honey in a bowl and add the oil while whisking season to taste with lemon juice, salt and pepper. Dress the salad and mix well. Chop the herbs and scatter on top. Serve. My French colleague Fabienne is always very impressed by my cooking/baking skills and says that she can’t cook. I don’t believe her, I think all French women can cook. And so far she has not been able to convince me, especially not when passing on great recipes like this. I am referring to the mustardy leeks which are divine although so very simple to make. It is just three ingredients, four if you want to use some nutmeg, and it goes so well with fish, especially if it is a bit plain like my Alaskan pollock above, fried in butter with lemon pepper. 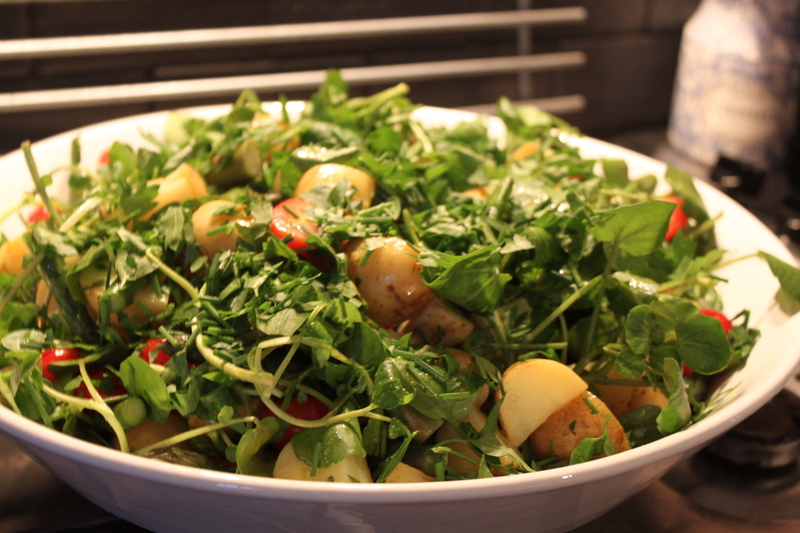 Together with a fresh potato salad this is healthy, cheap and delicious weekday food! Start by cooking the potatoes. Cut them in half and leave to cool. Put the cabbage in boiling water just to blanch it. Drain after a few minutes. Rinse in cold water. Mix potatoes, cabbage, radishes, parsley, lemon, and oil and mix thoroughly. Place on a platter. Fry the leeks on low heat in a saucepan until soft and not browned. Add creme fraicge and mustard. Season with salt and pepper (and nutmeg). Fry the fish in butter. Season with lemon pepper. Serve! Loving the weather right now! Here in London it has been around 20C for a while now, and the sun is shining every day, although battling the clouds from time to time. And this weather just calls for lighter food, don’t you think? 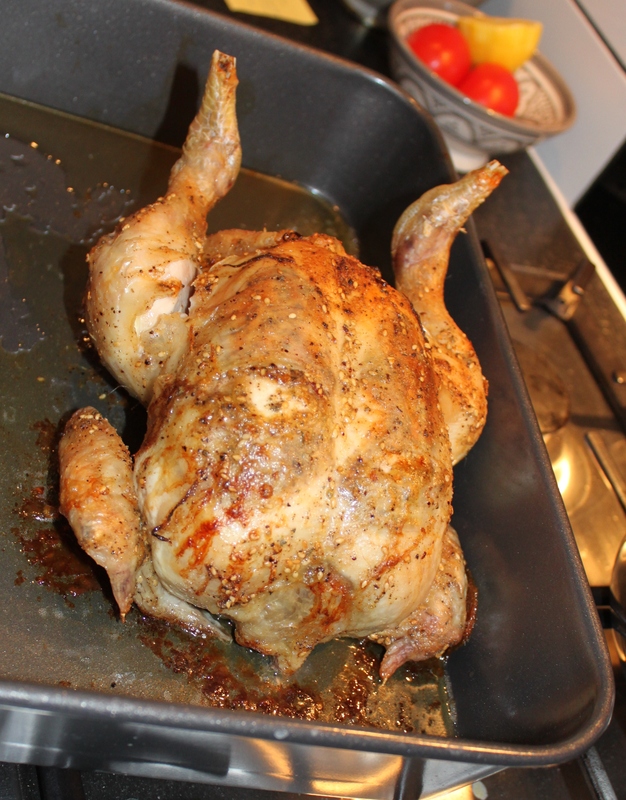 On Sunday I did a different take on the Sunday roast with a whole roast chicken, flavoured with za’atar, sumac and lemon served with a classic French potato salad and a side salad. Easy peasy and sooo good! Try this at home, folks. Heat the oven to 200C. Rinse the chicken and place in a roasting tray. Mix butter with spices and the zest from the lemon. Make a cut i the skin on each breast, and place most of the butter there. Smooth it out underneath the skin so it covers most of the breasts. Brush the bird with the remaining butter. Add some more salt and pepper. Place the lemon in the cavity. Place in oven for about an hour. It is done when the meat juices are clear from the thigh joint. Leave to rest a little before serving. Boil the potatoes, leave to cool. Dice. Mix creme fraiche, mayonnaise, mustard and seasoning. Add the potatoes. Cut the chives with scissors and add to the salad before serving. Stir to combine. When one lives in a flat without either balcony or patio one is extremly happy when friends invite one over for a barbecue a sunny Sunday in April. It was certainly perfect barbecue weather yesterday, and while our friends Ian and Anna prepared the lunch, Christopher and I got the hard task of sitting in the sun sipping wine. It was a great lunch that consisted of many goodies; homemade sausage rolls, chipolatas, homemade burgers, marinated lamb, new potatoes, potato salad with egg and gherkins, salad and homemade trifle for dessert. Thank you! We certainly enjoyed it!